where X and Y are domain variables and List is a list of domain variables. True if the X:th element of List is Y. Operationally, the domains of X and Y are constrained so that for every element in the domain of X, there is a compatible element in the domain of Y, and vice versa. Maintains domain consistency in X and bounds consistency in List and Y. Corresponds to nth1/3 in library(lists) and to element/3 and member/2 in MiniZinc. where X and Y are domain variables and MapList is a list of integer-ConstantRange pairs, where the integer keys occur uniquely (see Syntax of Indexicals). True if MapList contains a pair X-R and Y is in the range denoted by R. Maintains domain consistency. Defines an n-ary constraint by extension. Extension should be a list of lists of integers, each of length n. Tuples should be a list of lists of domain variables, each also of length n. The constraint holds if every Tuple in Tuples occurs in the Extension. The constraint will maintain domain consistency. Corresponds to table/2 in MiniZinc. For convenience, Extension may contain ConstantRange (see Syntax of Indexicals) expressions in addition to integers. The order is the one given in the arguments (the default). Each tuple, and the columns of the extension, is permuted according to the heuristic that more discriminating columns should precede less discriminating ones. SICStus choice handles propagation as it sees fit (the default). SICStus handles propagation with the case/[3,4] constraint, see below, converting the extension to a DAG. SICStus handles propagation with the case/[3,4] constraint, see below. Before converting the extension to a DAG, an auxiliary, first variable is introduced, denoting extension row number. This constraint encodes an n-ary constraint, defined by extension and/or linear inequalities. 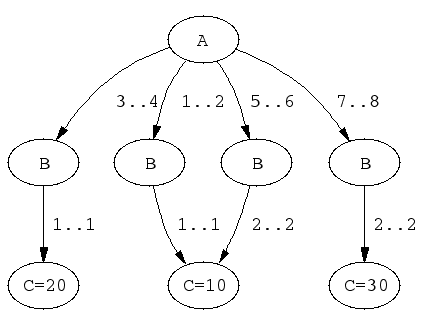 It uses a DAG-shaped data structure where nodes corresponds to variables and every arc is labeled by an admissible interval for the node above it and optionally by linear inequalities. The variable order is fixed: every path from the root node to a leaf node should visit every variable exactly once, in the order in which they occur lexically in Template. The constraint is true for a single ground tuple if there is a path from the root node to a leaf node such that (a) each tuple element is contained in the corresponding Min..Max interval on the path, and (b) any encountered linear inequalities along the path are true. The case constraint is true for a set of ground tuples if it is true for each tuple of the set. The details are given below. Template is a nonground Prolog term, each variable of which should occur exactly once. Its variables are merely place-holders; they should not occur outside the constraint nor inside Tuples. Tuples is a list of terms of the same shape as Template. They should not share any variables with Template. Dag is a list of nodes of the form node(ID,X,Children), where X is a template variable, and ID should be an integer, uniquely identifying each node. The first node in the list is the root node. Nodes are either internal nodes or leaf nodes. For an internal node, Children is a list of terms (Min..Max)-ID2 or (Min..Max)-SideConstraints-ID2, where ID2 is the ID of a child node, Min is an integer or the atom inf (minus infinity), and Max is an integer or the atom sup (plus infinity). For a leaf node, Children is a list of terms (Min..Max) or (Min..Max)-SideConstraints. SideConstraints is a list of side constraints of the form scalar_product(Coeffs, Xs, #=<, Bound), where Coeffs is a list of length k of integers, Xs is a list of length k of template variables, and Bound is an integer. Variables in Tuples for which their template variable counterparts are constrained by side constraints, must have bounded domains. In the absence of side constraint, the constraint maintains domain consistency. The use of side constraint is deprecated, because the level of consistency is no better than the alternative, namely to use separate, reified arithmetic constraints and possibly auxiliary variables. A side constraint located at the root of the DAG. | ?- elts(X, Y, Z). | ?- elts(X, Y, Z), Z #>= 15. | ?- elts(X, Y, Z), Y = 1. As an example with side constraints, consider assigning tasks to machines with given unavailibility periods. In this case, one can use a calendar constraint [CHIP 03, Beldiceanu, Carlsson & Rampon 05] to link the real origins of the tasks (taking the unavailibility periods into account) with virtual origins of the tasks (not taking the unavailibility periods into account). 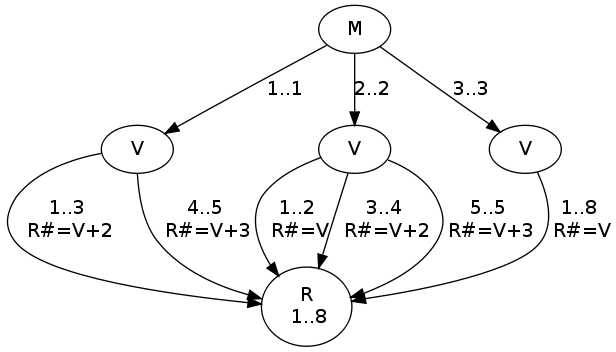 One can then state machine resource constraints using the virtual origins, and temporal constraints between the tasks using the real origins. Unavailibility periods for three machines. Machine 1 is not available during (real) time periods 1-2 and 6-6, machine 2 is not available during (real) time periods 3-4 and 7-7, and machine 3 is always available. Note that equality must be modeled as the conjunction of inequalities, as only constraints of the form scalar_product(+Coeffs, +Xs, #=<, +Bound) are allowed as side constraints. calendar(M, V, R), M #= 1.
calendar(M, V, R), M #= 2, V #> 4.